the power plant is prepared to withstand all anticipated transients, which are of importance in reactor safety and in must be proved and declared in the Safety Analysis Report (SAR). Nowadays reactor core analyses and design are often performed using nodal two-group diffusion methods. These methods are based on pre-computed assembly homogenized cross-sections, diffusion coefficients and assembly discontinuity factors (pin factors) obtained by single assembly calculation with reflective boundary conditions (infinite lattice). Highly absorbing control elements are represented by effective diffusion theory cross-sections which reproduce transport theory absorption rates. These pre-computed data (discontinuity factors, homogenized cross-sections, etc.) are calculated by neutron transport codes which are based on a more accurate neutron transport theory. In short, neutron transport theory is used to make diffusion theory work. The neutron transport equation is the most fundamental and exact description of the distribution of neutrons in space, energy, and direction (of motion) and is the starting point for approximate methods. The diffusion equation can be derived by adding an additional assumption that the angular flux has a linearly anisotropic directional dependence in problems with isotropic sources and scattering. This allows the removal of the directional variables from the neutron density and simplifies the governing equation and associated numerical methods. It is common practice, these methods can be divided into two classes based on the relative spatial mesh size over which the numerical approximations are valid. Finite difference methods are generally restricted to very small spatial meshes (fine mesh method) in reactor applications — typically about 1cm. Nodal methods are based on a higher-order (or even analytical) expansion of the solution in the spatial variable and are applied to meshes much larger (coarse-mesh method) than a mean free path. There are about 60 000 fuel pins in a reactor core. In order to evaluate thermal margins these fuel pins have to be divided to about 50 axial levels (axial nodalization). At one state point coupling of neutronics/fuel heat conduction/coolant hydraulics/structural mechanics is needed to evaluate thermal margins. Each fuel cycle have to be analyzed for about tens of states (fuel burnup) and about 300 isotopes must be tracked. Millions of cycle depletion simulation have to be performed for designing loading design and optimization. Hundreds of startup and maneuver simulations have to be performed. Hundreds of transient accident simulations have to be performed for safety analysis. In result, at the current speed of computational machinery, it is absolutely impractical to perform all of these calculations by applying fine-mesh transport methods to a model containing detail at the level of individual fuel rods, control elements, and coolant regions in an entire reactor core. Reference: Scott W. Mosher, A Variational Transport Theory Method for Two-Dimensional Reactor Core Calculations. Georgia Institute of Technology, 2004. Lattice Cell Homogenization. In the first phase the reactor core is decomposed into relatively small sub-regions of the core, called lattice cells. 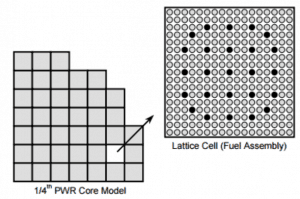 A lattice cell typically contains a single fuel assembly plus half of the surrounding coolant gap and is precisely modeled in two-dimensional geometry with materials characterized by fine-group cross sections (100s of energy group). The reflective boundary condition (infinite lattice) is used, it is equivalent to a problem involving an infinitely large core composed of a single type of assembly. These calculations are performed by two-dimensional neutron transport codes which are based on a more accurate neutron transport theory. The neutron flux distribution from these fine-mesh calculations is used to spatially homogenize and condense (with respect to energy) cross sections and to calculate pin power factors. In this phase, self-shielding corrections are applied on the flux distribution. The homogenized lattice cell data are then used in a simplified core model to which less expensive diffusion theory is applied in the second phase, the nodal calculations. Nodal Calculations. 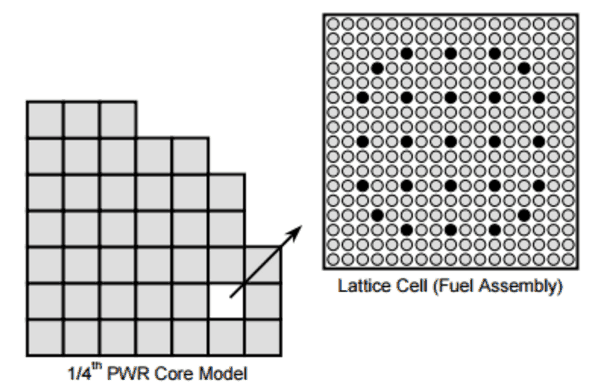 A homogenized lattice cell (one single node) is typically represented by a 20 cm high section of a single fuel assembly. The nodal approach involves a high-order or analytical expansion of the intra-nodal flux shape in order to achieve a higher degree of accuracy, for a given node size, than the conventional finite difference approach to discretizing the spatial variable. The nodal balance equation, which is derived from 3D steady-state multigroup neutron diffusion equation and the nodal balance equation is solved within each node. There is a set of equations for the surface average currents instead of solving 3D finite difference equations directly. In approaching surface averaged current, the average of flux derivative on a surface is approximated as the derivative of average flux at the surface. It is more efficient to work with the diffusion equation for average flux rather than diffusion equation for 3D point wise fluxes. A transverse integration procedure is often employed to reduce the multi-dimensional equations to a set of coupled one-dimensional equations. The resulting system is then solved on a three-dimensional core model consisting of homogeneous nodes characterized by the generalized equivalence theory (GET) constants generated in the first phase. Flux Reconstruction. In this phase it is necessary to predict the neutron flux in individual fuel rods (pin-by-pin). Therefore we need the heterogeneous solution. The heterogeneous solution is reconstructed from given homogenized solution. The detailed, or heterogeneous, flux distribution can be approximated by modulating the smooth nodal solution with the fine-mesh transport solutions using a variety of techniques. The figure shows superposition of lattice flux (form functions) determined by fine-mesh transport codes with nodal fluxes determined by nodal calculations. The efficiency of nodal methods is very high and comparable with the finite difference methods. It is very fast and allows us to compute such huge number of reactor states. It must be added, using this method one can get only approximate information about the neutron flux in a single node (or coarse-mesh area, usually a single fuel assembly of a 20 cm height). This analysis requires many subsequent calculations of the flux and power distributions for the fuel assemblies while there is no need for detailed distribution within the assembly. 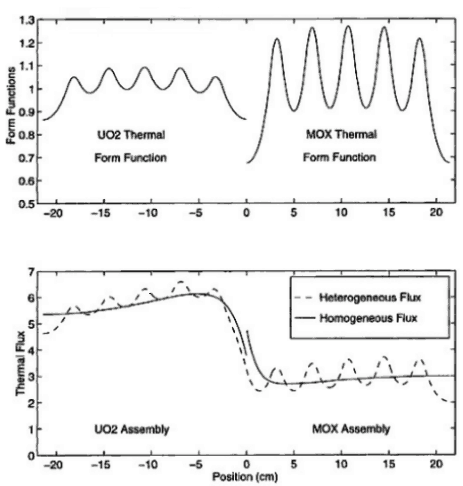 For obtaining detailed distribution within the assembly the heterogeneous flux reconstruction must be applied. However homogenization of fuel assembly properties, required for the nodal method, may cause difficulties when applied to fuel assemblies with many burnable absorber rods, due to very high absorption cross section (especially with Gd – burnable absorbers) and very strong heterogeneity within the assembly. Mid-term analysis of reload strategy comprises especially calculations of the fuel requirements for several reloads in a row using simple nuclear codes that are based on point kinetics and linear reactivity model. This analysis aims to optimize number of fresh fuel assemblies, their enrichment and neutron leakage from the reactor core during several years (Mid-term analysis). Proposal of a reference loading pattern or proposal of transition to a new fuel strategy is based on searching the loading patterns using 3D computational codes. Such outputs are crucial in respect of entire nuclear calculations. They provide detailed knowledge about behavior of the reactor core during the fuel cycle. The output consist of proposed fuel loading pattern which must meet energy (cycle length on full power) as well as all safety requirements such as power distribution, peaking factors, reactivity feedbacks. These calculations can be extended by a cycle optimization, meaning especially searching the low leakage loading patterns with enhanced neutron and fuel economy.